"Over the years I have come to Admire the people behind the creation of outstanding courses, such as Samuel Morse (Pebble, Cypress, etc.) and Hal Thompson at Shoal Creek. I would now add Joel Moore and The Ridge at Back Brook to that list." Offering spectacular long-range views, this slight dogleg right will produce lots of pars and birdies. The elevated terraced tee boxes are cut through a dense stand of deciduous trees, while one of the club’s landmarks—Back Brook—runs along the right side of the hole. From the back three tee boxes, drives will have to carry a small ravine to a generous landing area which will set up a relatively short iron to the green. Beware of the pond hugging the right side of the green. Playing from a network of staggered tee boxes, the first of five great par 3s demands accuracy off the tee. A middle iron will have to find the putting surface since the green is protected by a lake on three sides. Golfers hitting anything short or to the left will probably find themselves teeing it up again. It’s The Ridge’s version of an island green. Remember to factor in the wind. 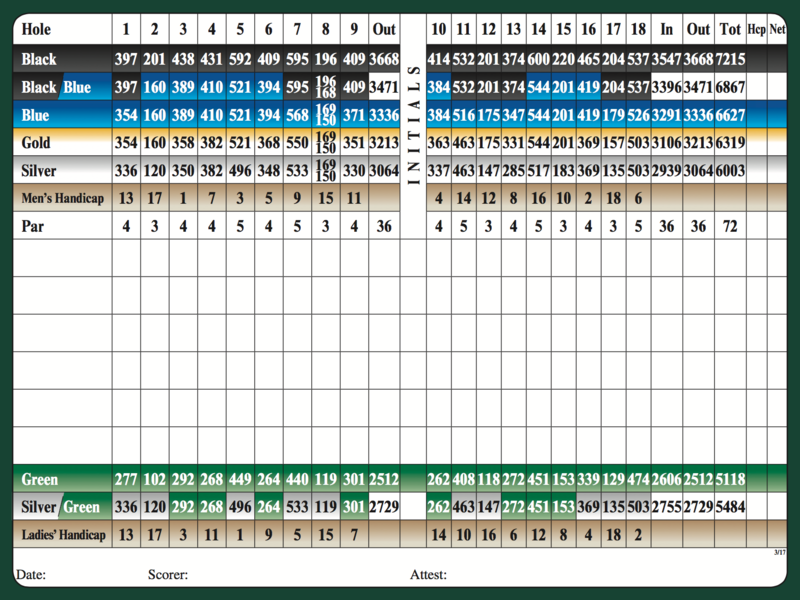 The beauty of this magnificent par 4 is matched only by its degree of difficulty. Playing from a series of tee boxes bordering a 7-acre lake, length and accuracy off the tee is vital if golfers expect to score here and avoid double bogie. Drives must fly over the lake to a landing area flanked by water on the left and trees on the right. The second shot of about 150 yards plays uphill to a well guarded green with the clubhouse in the background. 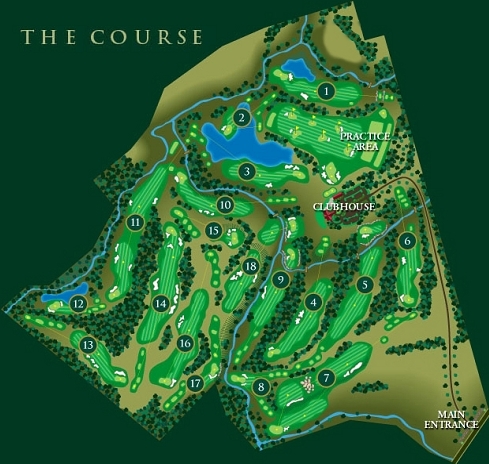 Golfers will welcome par on this long and tricky dogleg right which is the first of three holes to play through the forest. Although the tee boxes are some 40 feet above a chasm graced by a small, meandering creek, strong drives carrying the chasm play slightly uphill to a landing area guarded by a pair of fairway bunkers. Second shots require accuracy and play slightly downhill to a green nestled on a bluff. Shots missed right of the green will fall some 20 feet below the putting surface. The first of the great par 5’s at The Ridge, this is one of the most striking holes on the front nine. A dogleg left that plays through forest, the tee shot plays slightly uphill and puts the player in position to either lay up on top of the hill or play a long iron or fairway wood to the bottom of the chasm in front of the creek. A short iron will reach this picturesque and elevated green that has been cut into the hillside and framed by a rock wall above the creek in the front and a natural red rock wall behind. A sleeper hole whose championship tee box sits directly on top of a ridge, this slight dogleg right plays approximately 18 feet uphill to an angular landing area flanked by dense forest and guarded by fairway bunkers right and left. A good drive sets up an uphill shot of between 140-160 yards to a green guarded by a bunker on the front left side. Par is a good score here. Perhaps the most dramatic hole on the front nine, this par 5 features a 100-foot elevation drop from tee to green and a unique split fairway. This offers golfers the visual and strategic option of hitting their second shot along the upper fairway, or playing to the lower fairway guarded by a stream some 30 feet below. The natural red rock wall separates the upper and lower fairways. For those choosing the upper landing area, their second shot has to carry a series of excavated rock outcroppings aptly named the “moonscape.” A short iron from either fairway will get golfers onto the green in three with a shot at birdie or par. At this picturesque par three, the real challenge will be trying to stay focused on your game and not the magnificent setting. This eye-catching hole features a wishbone tee box configuration – three left and three right – with the championship tee nearly 60 feet above the green which is situated on a peninsula with Back Brook running along the left side and just beyond the putting surface. A 65-foot sheer wall of rock outcroppings provides a breathtaking backdrop to the green. Playing in the valley, this solid par four is graced by dense forest on the right and The Ridge which runs parallel with a stream along the entire left side. From elevated tee boxes, a strong tee shot must favor the right side of the fairway to put the golfer in an ideal position to attack the flag. Club selection on the approach shot is critical as golfers must negotiate a stream, a seasonal wetlands area and a stone wall to reach a green flanked by natural red rock outcroppings. A sharp dogleg right that plays from elevated tee boxes, this hole requires players to drive over Back Brook to the left side of a lower fairway framed by a ridge on the left and a stream on the right. From this position, golfers will avoid having to hit their approach shot over the stream again, and will have a better angle to the green, which is flanked by a set of sand traps and the high bank of the stream on the right. One of the longest holes on the course, this slight dogleg left is cut through the woods and plays gradually uphill to a green guarded by multiple bunkers. Golfers must play two solid and well placed shots to set up a short iron to the green. Drives from the tee box alongside a lake must traverse Back Brook and wetlands, while second shots must carry strategically placed bunkers which border the fairway and green. Cut out of a cedar forest and playing downhill, this picturesque par 3 can be very deceptive and will yield all types of scores. Accuracy off the tee with a middle to long iron or fairway wood is critical as the green is tucked into a recessed area of the pond on the right. There is little margin for error to avoid the water on the right and bunkers guarding the green front and back. Deception rather than superstition comes into play on Lucky 13. Although a relatively short par four, it is much tougher than it appears because it plays 45 feet uphill, adding at least two full club lengths. To set up an appropriate approach to the green, drives must favor the left side of the fairway to avoid a quartet of bunkers to the right of the landing area. A short iron must find the putting surface to avoid significant grading, contours and two large bunkers protecting the green. Fourteen, a par 5, plays 60 feet downhill. A good drive placed between bunkers right and left will put you in position for either perfectly laying up in front of an elevated green or, for the big hitters, attacking the green. But beware, there is a fairway bunker 50 yards in front of the green and the green is surrounded by large bunkers. One of the best par 3s on the course, this hole can create a false sense of security because it looks much easier than it plays. To set up par, golfers must get distance off the tee with a long iron or fairway wood to avoid coming up short and landing in a large, deep bunker that sits 18 feet below the front of the green. Errant shots to the left will face a steep uphill second shot, while anything long will face a difficult downhill chip. A long par 4 that may prove to be an uphill battle for some golfers, this slight dogleg right plays approximately 30 feet uphill to a well guarded green. Fairway contours, grades and a series of bunkers on the right make it critical to hit the fairway off the tee. With a good lie, a long iron or fairway wood will give golfers an opportunity to reach the green or lay up and play a wedge to the putting surface. Seventeen is a mid-length par 3 that will produce some very large numbers if golfers aren’t careful. The green is fronted by a large bunker that curls around the right side and is perched on the edge of the ridge, so shots through the green will be lost eighty feet below. Aim for the middle of the green, make your par and proceed to 18. As dramatic a finishing hole as there is in golf, the tee sits 60 feet above a green protected by a stone wall just above a stream. Playing downhill along the top of The Ridge, golfers must drive over a deep depression to the left center of the fairway, then go with a long iron or fairway wood to the second landing area 45 feet below. A short iron or pitching wedge up over the stream and stone wall to an elevated green sets up a birdie opportunity on this majestic hole.